Is your Prescott, AZ air conditioning system blowing out hot air? If the answer is yes it can be the result of an AC cooling problem that can be caused by a host of various problems. These various problems are something that can only be examined and diagnosed by someone who is a car air condition expert. This is because a certified and experienced auto mechanic is the one professional who can determine exactly what is what with a car air conditioning problem from the onset. 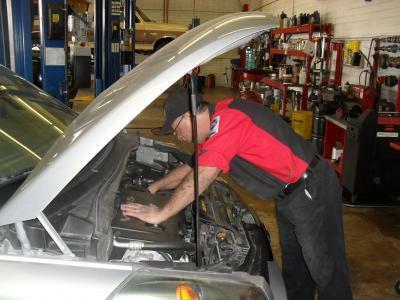 They have to examine the issue firsthand and this is what helps them to figure out what is exactly wrong with an automobile Prescott, AZ air conditioning system. They have not only the required expertise to get to the root of the problem, but also, what it takes to properly maintenance it or repair it to get it back into excellent working order. There are numerous issues that can change a car air conditioning system from cooling properly to blowing just nothing but hot air out. However, it is a highly qualified auto repair business, who can go inside of the car's air conditioning to get at what the reason is for the hot air and no more cold air. One of the most common of all reasons why a car starts to blow out hot air instead of cold air is due to the fact it has lost its charge of refrigerant. This lack of refrigerant can be the very thing to shut a car's air conditioning system down faster than anything. Another problem that can happen is with the car's air conditioning compressor. It can develop a form of electrical fault in the A/C compressor circuit or in the magnetic clutch that does drive the compressor itself. These are just a couple examples. To have you Prescott, AZ Air Conditioning in your car checked out call us today. Is Your Prescott, AZ Air Conditioning Blowing Out Hot Air In Your Car?